The puzzle game of Bible-size fun! Create an exciting scene from the Bible! How quickly can you finish the puzzle? Watch out — the funny details in the pictures will try and distract you! Every time he reads his Bible, the stories leap right out of it’s pages! Join the fun as Mini Mike rides dinosaurs, marches Jericho, and flees from soldiers. Lucky for him, being small helps him escape quickly and makes it easier to hide. You'll have to search carefully to find him, in each captivating scene of Bible adventure. 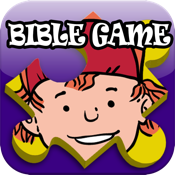 - BIBLE STICKER Fill in the Bible scenes with their missing pieces, to score big! - BIBLE GAMES With 5 exciting games.